On behalf of the Board of Management, Mr. Papastergiadis congratulated Minister Mikakos for her appointment as the Minister for Health, one of the most important Government portfolios, that has the 2nd largest budget - after infrastructure investment - in the Victorian Government. 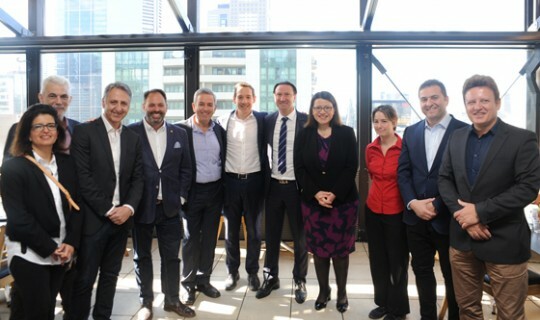 The purpose of the meeting was to brief the Minister of the future plans and directions of the Greek Community as well as the exchange of ideas of the feasible projects that will enhance the cosmopolitan image of Melbourne and the State of Victoria. Both representatives of the Greek Community thanked the Minister for her ongoing support and in particular expressed their gratitude with respect to the recent announcement of grants that have been allocated to the GCM. During the course of the discussion, the Minister assured the Greek Community representatives that the State Government has committed to inform and consult with all parties involved (including property owners) of the ongoing developments regarding the North-East arterial link. The GCM will be involved in the consultation process that will take place in the very near future. The $2.5 million grant, to be provided to the Greek Community was discussed and commitment was given towards a City infrastructure project which will hopefully create new facilities for the Greek Community of Melbourne. Ms Mikakos also took an active interest in the commencement of the reproduction of the Parthenon Frieze that has been commissioned and undertaken by the Greek company «The art of marble and stone P.C.». The construction of 25 meters of the Western Parthenon frieze will be carved on Dionysos marble by the renowned sculptor Constantinos Dousis. Finally, both the Minister and the executive members of the GCM discussed the feasibility of establishing a Chair of Diaspora, at Tertiary level, in Melbourne. The concept of focusing on the Greek diaspora and its extensive networks throughout the world and using such a model to examine and research other diasporic communities received unequivocal support from the Minister. After the conclusion of the meeting both the President and the Secretary of the Greek Community noted that “2019 will be a pivotal year for the GCM with a number of projects that are due to commence that will benefit the Greek community, build social connectedness with younger generation Greek Australians and strengthen community engagement”. “Our relationship with the Government has never being stronger and we are proud to work with them on ensuring Melbourne is the multicultural and cosmopolitan capital of the world, with the Greek Community of Melbourne playing pivotal role in defining Melbourne accordingly,” said Mr Papastergiadis.